Read and sign the original Declaration of Reasonable Doubt. Is the First Folio fooling us? “Impossible Doublet” in the Droeshout engraving makes Shakspeare look ridiculous! Now you can listen to actor Michael York read the Declaration of Reasonable Doubt as you read along. New SAC video by Keir Cutler asks: Is the Birthplace Trust Trustworthy? SAC News: What we've accomplished; what's next after the 400th anniversary? What is the SAC about? 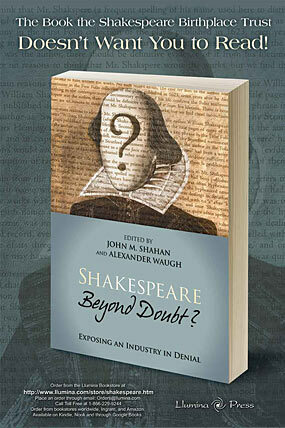 The Shakespeare Authorship Coalition runs this website so anyone who cares about Shakespeare, as we do, can easily see why his identity has long been in doubt, and sign a definitive declaration addressing the issue — the Declaration of Reasonable Doubt About the Identity of William Shakespeare, located on this site. We have nothing against the man from Stratford-on-Avon, but we doubt that he was the author of the works. Our goal is to legitimize the issue in academia so students, teachers and professors can feel free to pursue it. This is necessary because the issue is widely viewed as settled in academia and is treated as a taboo subject. We believe that an open-minded examination of the evidence shows that the issue should be taken seriously. Your signature on the Declaration will help us make the case that there is reasonable doubt about the author. The Declaration was written to counter orthodox claims that there's no doubt who wrote the works. It provides a concise, definitive overview of the evidence and arguments for and against William Shakspere of Stratford as the author. It was written not just to advocate, but also to educate the public about the controversy. Nearly three dozen Shakespeare scholars helped write it, and even some supporters of the Stratford man have praised it. Among the many prominent people who have signed the Declaration are actors Derek Jacobi, Jeremy Irons, Michael York and Mark Rylance, founding Artistic Director of Shakespeare's Globe Theatre in London, and former U.S. Supreme Court Justices John Paul Stevens and Sandra Day O'Connor. The signatories page on this site shows a complete list of all signatories, plus separate lists for notable and academic signatories. Why Was I Never Told This? Read and sign the Declaration. Then, help spread the word. Now available at bookstores worldwide. Finally, please make a tax-deductible donation to the SAC. Click on the button to the right to make an online donation, or send a check to the address shown on the donations page.